February 27 would have been my Mom’s birthday. I have thinking about her so much since the latest school shooting. My Mom taught school for 30 years. Most of the time she taught fourth grade. There are some families for whom she taught multiple generations of children. I also work in a school. It focuses on helping students who do not learn well in a traditional school setting. We have children who have anxiety disorders, ADD/ADHD, extremely brilliant children, bullied children, those on the autism spectrum, gay children, transgender children, depressed children, all special, all worthy and all needing an extra boost. And I wonder how we will continue to keep all children safe from the outrageous behavior coming from the adults in our country. I have been wondering what my Mom would think of all this gun violence and what she would do if she was still alive. Our family nickname for my Mom was ‘Norma Rae.’ This was based on the Sally Field character in the movie of the same name. Norma Rae had enough at her job and becomes a labor activist. She makes a difference. My Mom might not have been a labor activist, but she never stayed quiet if she saw a wrong. She also made a difference. She taught me to speak up and speak out! Maybe it is because she knew the tragedy of mass murder, since two of her grandparents and many family members were murdered in the Shoah. Or maybe it was because she learned from example. Her parents were strong willed people who came to the USA on their own in the 1920s with nothing, and built a business, a life and a family. I believe my Mom would not have remained silent right now. So to those who have asked me who I am working for politically. I am not working for anyone. Rather I am working for every child who goes to school. I will keep calling my legislators. I will keep supporting organizations that combat gun violence. I will keep posting about topics that upset me, that I think are wrong. And I will not remain silent. Dante wrote in his famous poem, “The Infernal,” that the hottest place in hell is for those who remain silent in times of moral crisis. I will not remain silent. I feel my Mom with me and I feel her fire and passion for her students. We really need to keep our children safe and let them know they are loved, special, unique and worthy. How do we do that? First there are about 5,000,000 members of the NRA. But there are over 325,000,000 citizens of the USA! Easy to see that 320,000,000 Do Not belong to the NRA. The NRA uses its money to buy our legislators by lobbying and giving them so much money for their campaigns. We, the people, need to STOP this NOW! 1. Do not buy from companies that support the NRA. A boycott has started, and I will support it. 2. Give money to legislators who promise to fight for safe gun laws and the banning of assault weapons and items that boost these weapons to more dangerous levels. I plan to continue to do this. 3. Let us work to get a ban on ammunition used in these killing guns. 4. Do Not vote for elected officials on any level of government who is financially indebted to the NRA. 5. Reject the NRA’s messages of hatred and divisiveness. I do not dislike people who own guns. I just dislike certain types of guns. 6. We have to put our money where our heart is and use it effectively. I am for a buy back of all assault weapons. I understand they cost about $600. I will give $1800 to buy back three. This amount calls out to me because 18 is the numerical value of the Hebrew word chai, life. I would give a hundred times life to save one life. 7. Let us insist they tighten the laws surrounding gun sales and the raffling off of guns as fundraisers. People should not be allowed to buy guns at gun shows and privately without background checks. 8. Tighten the laws surrounding background checks. We see they are failing us right now. 9. Increase funding for mental health care. Our government is supporting a cut to health care for all. The only industrialized nation that dies not provide health care for its citizens! Let us work to change this. 10. Keep calling and writing my elected officials to express my views on gun control laws and health care laws. 11. Support an organization that works to counter gun violence, like Grandparents Against Gun Violence, https://moksgagv.org, Gabby Giffords group Americans For Responsible Solutions https://giffords.org, Brady Campaign to Stop Gun Violence http://www.bradycampaign.org. 12. Be KIND! There is too much divisiveness and hateful speech right now. Use your words for good. I will be wearing this pin that says Chai to remind myself to work for life. Working for safer gun laws is my personal plan to respect life. We were in San Juan, Puerto Rico in June. A lovely island for a day of sight seeing as we cruised the Caribbean. 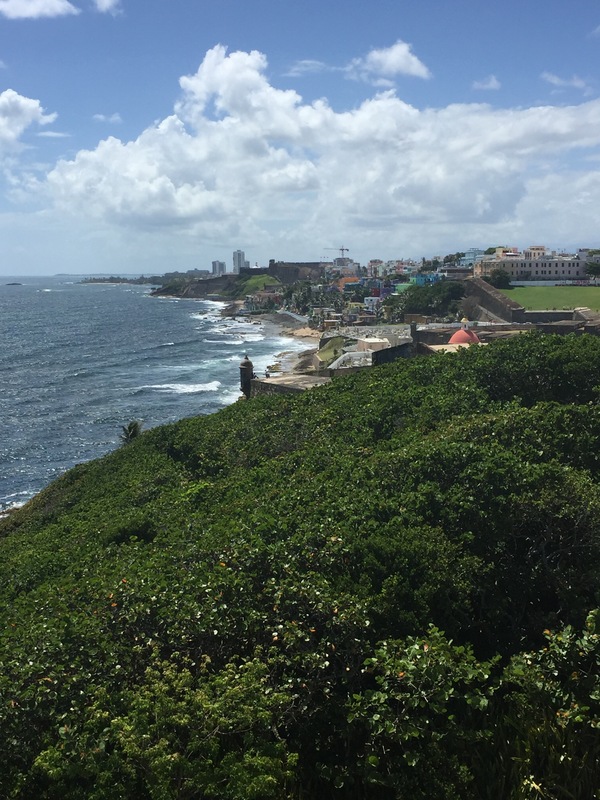 We took a bus to the Fort in San Juan, and then a walking tour from the Fort back to the ship. 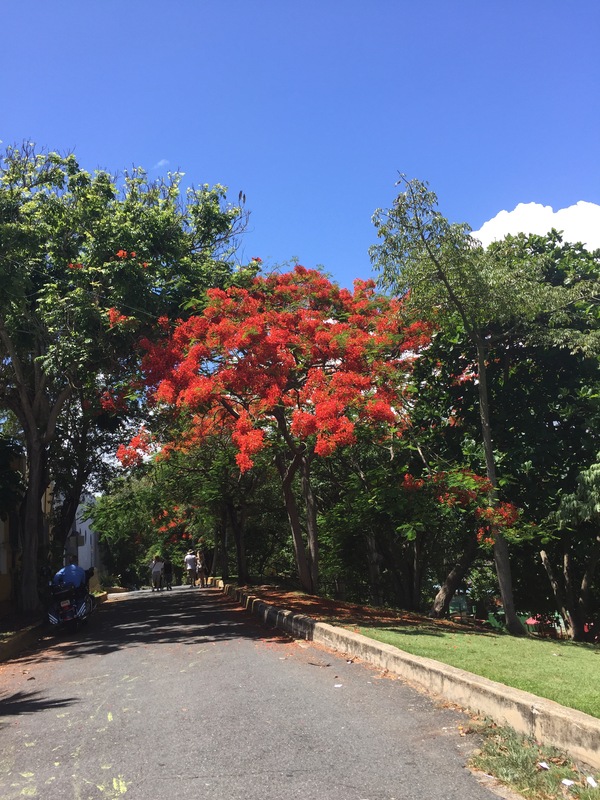 We passed beautiful flowering trees and plants, lush gardens, We toured the Fort that overlooks the ocean and once protected the island from invaders. We looked down the coast to see the lovely beaches. But Hurricane Maria has devasted the island. So many millions without food, water, housing. Searching for a way off the island, tourists who live elsewhere are stuck, stranded away from their home. While those whose home is Puerto Rica are afraid of the future. When where the power grid be repaired, when will the water and the food be available again. When will the roads be fixed. When will medical care and schools be able to return to normal. 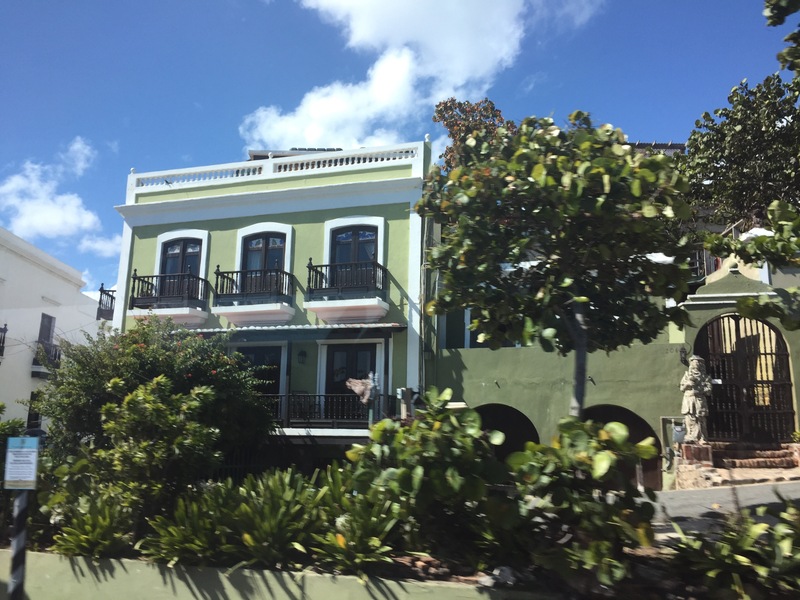 Puerto Rico is one of many islands that faced destruction in the way of Hurricane Irma and Maria, while Florida and Texas also suffered horrors during to hurricane season, Hurricane Harvey and Irma impacted these areas. Connected to other states and cities, Florida and Texas are fortunate in that help can come more quickly for these impacted areas, where as the islands of the Caribbean are isolated. Cruise ships are cancelling vacation cruises in order to help evacuate the islands and bring supplies. But in reality, there is no tourism or vacation in some sections of the Caribbean now as the destruction of the islands’ infrastructures make tourism impossible. I cannot go there to help. But I can donate. I can provide tzedakah to those in need. I chose the “oneamericanappeal.org” that was endorsed by and set up by our five former presidents: Bush, Bush, Carter, Clinton and Obama: Republicans and Democrats coming together to help our citizens in need. I know that not everyone can help financially. But those of us who can, must. The island of Puerto Rico will never be the same. But perhaps it can even be better as the power grid is rebuilt and the water supply fixed…as it will be updated and modernized. The Virgin Island of St. Thomas was also devastated. These islands are our responsibility. The citizens of these islands are citizens of the United States. It has been a difficult time for many. Fires in the west and northwest are causing destruction and health issues. The many hurricanes have devasted areas with their high winds and flooding rains. I also sent sent a donation to help with these disasters as well through the Jewish Federation. With this season of asking for forgiveness, the time between Rosh Hashannah and Yom Kippur, I think that doing good for others , tzedakah and gemilut Chasadim, shows my commitment to tikkun olam. As I ask forgiveness for all that I might have done to hurt others during the year, I send donations to help those in need. The following is a report my Great Grandfather, Louis Goldman, made in a 1937 issue of the Bialystoker Stimme. It explains the reason why the Bialystoker Bikur Cholim decided that the organization needed its own offices. It seems asking for help from the community was just not working out. It gives the history of the decision to rent its own office. I think this might have be the precursor of the Bialystoker Home for the Aged, which was built over two years in 1929-1931. Here is his article, as translated by my friend Blumah and edited a bit by me for clarity. “The Bialystoker landsman in that time mostly lived in the East side (of New York City). The Bikur Cholim decided to put in that neighborhood a place for the sick people to receive help without difficulty. So they would be close to their neighborhood. They arranged for a doctor and arranged for a pharmacist to get them medicine. It was decided to give to the poor sick people a free pass to see the doctor and also pay for the medicine. A certain landsman, who had a hot dog /salami store on Essex Street, gave his store for the sick people to come to receive these passes and papers. This became the office where they could get the papers. But there was a problem: The store keeper would give out these free passes like a prize to his own customers who would buy meat from him. (This was not what was intended so,) It was decided to rent a place somewhere else. Next they found a butcher store from one of the landsman, Philip T. However there was not very convenient for several reasons. As my great grandfather, or the editor of the Bialystoker Stimme, entitled the article, “Trouble with the Office,” I think that was a fine assessment. Personally I loved how the store owner gave out free medical passes to his customers. One way to build a clientele, even though it was not ‘kosher.’ I know that they were trying their best to help their landsmen in need, without using the money needlessly. Building an office might have seemed that way to them. But eventually, having a paid secretary made more sense. So I assume the offices that my great grandfather is writing about was this office on 228 East Broadway. Eventually, definitely by 1937 when his article was written, the Bikur Cholim offices were included in the beautiful building that was finished in 1931. As I have said in earlier articles about my great grandfather, I am so proud to be his descendant. Each of these articles brings him to life. It has been a bizarre week in Kansas. First has been the trial of the man who killed two people at the Jewish Community Campus and one at Village Shalom in April 2014. I know his name, but it is not worth saying. He wants the publicity. He is a sick demented man who was able to get guns and act out on his baseless hatred. Second it is the anniversary of the killing of five innocent people in a quiet cul de sac. I knew one of them. I saw her brother and sister in law when they came to our synagogue to say Kaddish for her yahrzeit two weeks ago. Her death was shocking, happening just five months after the JCC shootings. I think the entire Kansas City metro was in shock after these two mass killing events. Finally, it is something her nephew posted. Saying that his aunt was an activist. She was. And she would want us to do something about the gun problem in the United States. And I believe she would. So I will say something. I have used a M-16 during target practice. It is a gun meant to use to kill. I have walked a path along the dorms at Mount Scopus at Hebrew University in Jerusalem, holding an Uzi. I was taught to hold it to my hip and spray in a half circle if I needed to shoot. In was 1974. The Yom Kippur War was still on everyone’s mind. And those of us who lived in the dorms had to do guard duty once a month. Usually I held the lantern. But we had to know how to use a gun, just in case the other person was injured or killed. I know that guns can be used for protection. But I also know that guns can be used to kill. And I do not believe in senseless killing. I believe that people are misinterpreting the Second Amendment because they are unwilling to accept what is needed: stricter gun laws. The Amendment states: “A well regulated Militia, being necessary to the security of a free State, the right of the people to keep and bear Arms, shall not be infringed.” The right to bear arms is tied to the need for a militia. We have no need for a militia now. There is no need for all these guns to be out in the public. I am not against people owning guns for sport, although it is not a sport I am interested in. I do not think that all gun owners would kill innocent people. But we see time after time, guns getting into the wrong hands. I am sick of the NRA’s intense lobbying of our legislative representatives. And how their gun money is swaying the votes to go against common sense. They do not want regulations; they do not want more background checks; they do not want licenses. To drive a car in this country, you have to have a license and insurance. You have to pass a test to prove you know how to drive. You should have to take a test to prove you know how to use a gun before you are allowed buy one!!! To move into an apartment for the first time, you have to have a background check. My son did: to rent an apartment, not even to buy a gun. But to buy a gun in some states people can just go into a store or go online or go to a gun show and buy a weapon of death. It has become too easy to kill in the USA. We have seen time after time innocent children and adults going to school, or going to the movies, or perhaps shopping at a mall, or to the gym, or in the case of Susan C. just standing in her driveway at the wrong moment. When will we say to the men and women who serve in our state and national legislatures that we will not vote for them if they take money from the gun lobbies? I think that enough is enough. Every one of us must make a stand and no longer remain silent. The NRA and gun owners should not be running our Congress. WE, The PEOPLE should be running Congress.